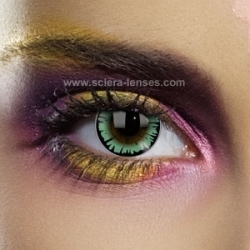 Let your eyes express themselves and create a stunning look with our exclusive range of Colored Contact Lenses. Use these accents to give yourself a new persona. Surprise your family and friends. Let your presence shine through and dominate the party with striking eyes. From subtle to vibrant, the lenses are available in nearly all colors and for amazing prices. You can also choose from three different kinds of tints: Visibility, Enhancement, and Opaque. Please remember that Colored Lenses may not cover 100% of your iris and that the overall effect depends on your natural eye color.